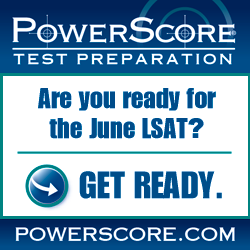 The LSAT is intended to measure the skills you will need to do well in the study of law. But how good a test is it? How important are “LSAT skills” once you get to law school? Reading Comprehension is important, which is why it seems to show up on so many different standardized tests. Without question, people who want to go to law school should be able to read and understand complex material. But the ability to read four passage sets and answer close to 30 questions, all within 35 minutes? I’m not convinced that’s crucial—Supreme Court Justices are never put under that kind of time pressure, and some of them seem pretty smart. What about Logical Reasoning? These sections account for half your score, and there’s a reason for that. The study and practice of law certainly necessitates the ability to assess arguments (note their strengths and weaknesses, understand what they seek to prove, recognize flawed logic, etc.). But again, assessing close to 60 arguments and responding to nearly 60 questions, all within 70 minutes, is not a feat that you will not likely have to replicate in law school, or anywhere else for that matter. And then there are the Logic Games. With the interaction of variables, requirements, conditions and prohibitions, the Analytical Reasoning section on the LSAT is intended to provide an abstract version of the application of laws in the real world. While a natural propensity in games does speak to a certain skill set, you won’t see too many cases turn on how many movie reviewers, for example, might have reviewed a particular film. The LSAT is definitely not a perfect test, but I’m not sure there is such a thing as a perfect test in this context. Unquestionably, some of what it takes to do well on the LSAT might not be all that applicable in law school, and there are certainly important legal skills that the LSAT is not intended to measure. But the real question is: how valuable is it to dwell on the test’s imperfections? And the answer is: not very. If you’re planning to take the LSAT, your time would be better spent in preparation than exasperation. The great news is that if you’ve had a hard time on a past LSAT, or you happen to find the test confusing initially, that does not seal your fate. One of this test’s imperfections: with preparation you can significantly improve your score. Further thoughts on the LSAT? Please post your thoughts in the comment below!